Highlighting the neighborhood's hidden buying power called key to plan. Old Louisville is a lot of amazing things. It’s America’s largest collection of Victorian homes. It’s the city’s densest neighborhood. The American Planning Association named it one of the nation’s 2016’s five “Great Neighborhoods.” Real estate site Redfin also named it one of the country’s top ten most bikeable urban areas. But you can’t walk to the store to buy your groceries. That’s a problem being tackled by a group of investors seeking to bring a new supermarket to the neighborhood. 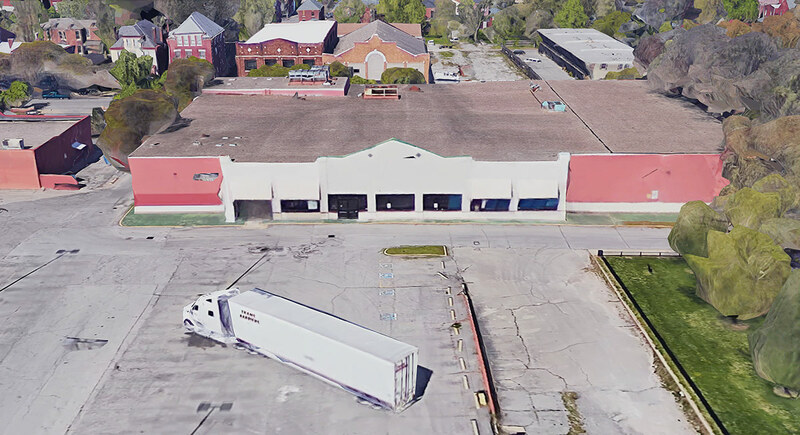 This month, the group of local and out-of-town interests purchased the vacant Winn Dixie site at 1148 South Fourth Street just north of Oak Street. The site was listed for sale last November for $1.75 million. The 2.35-acre parcel includes the former 43,000-square-foot Winn Dixie, its parking lot, and access roads. Local attorney and developer Joe Impellizzeri is working as developer for the ownership group. The Old Louisville resident has rehabbed several nearby buildings including the former Women’s Club on Fourth. Impellizzeri said the plan is to reuse the circa-1984 grocery to lure a new supermarket to the site. And he couldn’t express enough how significant—and challenging—such a move would be for the neighborhood. But so far the response has been cold. “One of the issues this project faces is how grocery stores select their sites,” he continued. Impellizzeri said today’s world of large-scale supermarkets began forming in the 1940s with consolidations of smaller grocery chains. One of the giants of the time was the A&P, which operated a store on this site for decades. Modern chains have grown so large, he noted, that they rely on national and regional real-estate brokers to guide them in their location decisions. And low-risk, suburban sites with higher broker commissions usually win the day. For instance, Impellizzeri pointed to Shelbyville Road in St. Matthews, replete with all sorts of grocery options. 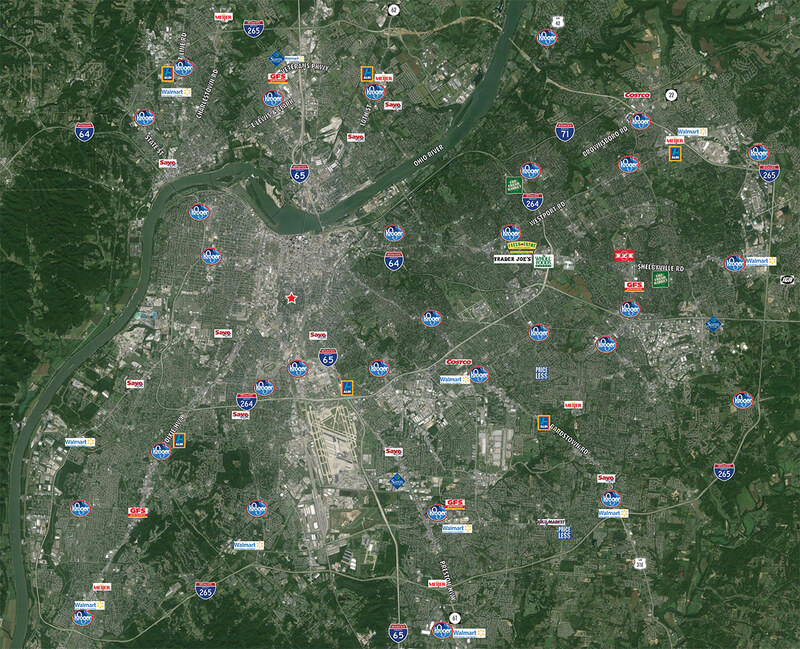 When a broker looks at that established corridor versus Old Louisville, they see low risk and high reward. But Impellizzeri is confident that there’s no risk for a grocer to set up shop on Fourth Street. “It’s not a question of market demand. We have a demand for a grocery store. Our neighborhood can support a grocery store,” he said. “We’ve got $52 million in sales in a 1.6-mile radius. What risk is there?” Among his goals is showing national brokers and grocers that, by the numbers, Old Louisville is a safe bet. “There is not a better site for a grocery store to serve our city than at Fourth and Oak,” he continued. 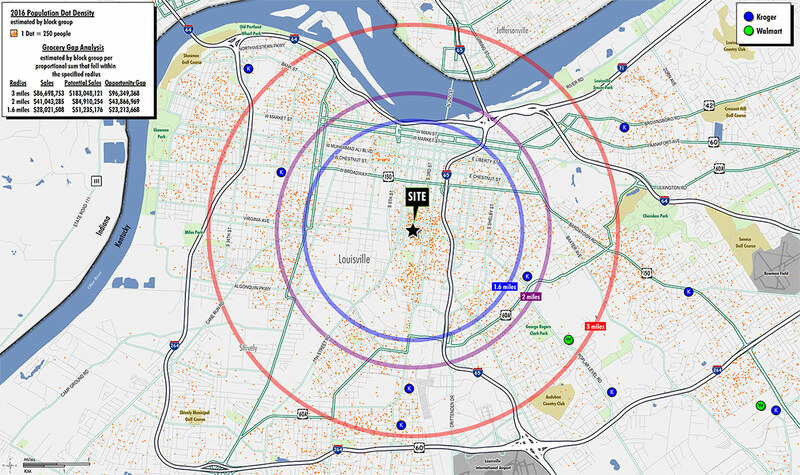 A map showing supermarket locations in the city depicts a clear doughnut around the urban parts of Louisville. That in spite of Old Louisville’s density and some of Louisville’s busiest bus lines passing along the parcel’s doorstep. “The way we’re going to succeed in developing this property is to harness the power of the collective,” he said. “It’s not just a couple grocery tenants. 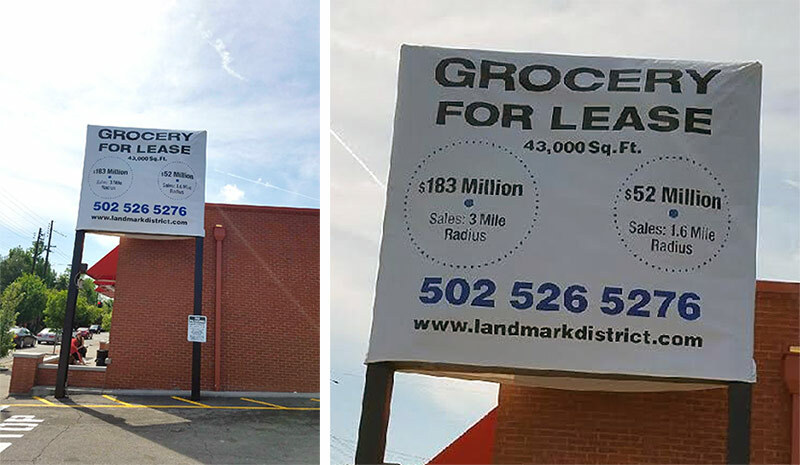 It’s got to be everyone in the neighborhood and everyone in the city who would benefit from a grocery at this location.” And with the recent closing of the Second Street Kroger and FirstLink groceries to the north, there are plenty of beneficiaries. 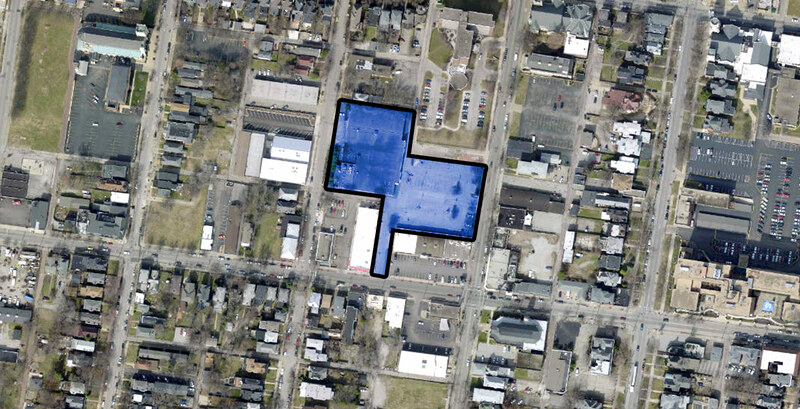 And that’s the next step—to get the neighborhood fired up about bringing a supermarket to Fourth and Oak. “Old Louisville is rich with people who care about the neighborhood and love it,” Impellizzeri said. “We’re very interested in meeting with all of them.” He added that his group wouldn’t be stopping at the neighborhood line, but asking for support from nearby neighborhoods as well. The Goss Avenue Kroger logo is missing from the map. 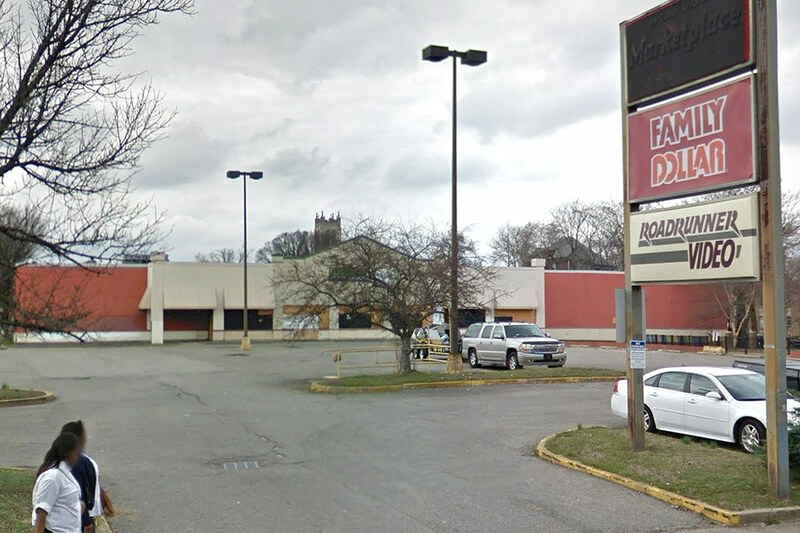 It’s also missing the Kroger on 3rd just north of the Watterson, and still showing the closed 7th Street Rd Kroger. Nitpicking aside, I’m a long-time Old Lou resident and I’m excited that someone with an incentive to get a tenant owns this now. The previous long term owner had a very ambitious plan a decade ago with all property owners on board or at least talking. But the recesssion of 2007 halted it, and the owner is now deceased but had a long record of grocery development … we had cooked up an Aldi/Trader Joe model for talking purposes . Joe is correct – the decades of disinterest in Fourth and Oak by the city and “develop” Louisville” gave us three health markets in three blocks on Shelbyville Road-heat islands all. The OmniCon of a “grocery” remains to likely never be seen. So how can a new grocery store survive in Old Louisville while a mega-chain like Kroger failed and was unprofitable? Trader Joe’s, Jungle Jim’s, etc. are obviously out of the question. Whats left? Aldi? ValuMarket (no value at that market)? Nobody seems willing to acknowledge the real reason that there is no interest for business at this location. All you have to do is drive by 4th and Oak to understand. The hidden problem here is not just the crime issues or the obvious demand for a grocery store. The reality is that the large, low-markup grocers that could take over the building have a model that depends on a high average sale per customer. Old Louisville offers lots of customers making frequent small purchases. Sadly, that is model that only works well for high-markup retailers like convenience stores and expensive specialty markets. While I am excited about Impellizzeri’s efforts, this will be a surprisingly tough sale to get a quality tenant. A larger rebuild of the entire southern half of the block might be more successful. Addressing the large numbers of idle adults loitering in the area might also be a piece of the puzzle too. How about a 1st run movie theater – there is enormous density. Per my demographics I believe the closest one is far enough away. 3 mi radius population is 125k+ and 54k households. Avg income on the low end but that’s pulling UofL and Sullivan students into the radius. A national operator wouldn’t do it but perhaps a well capitalized regional player. Sadly, you’ll never get a major grocery chain on that site – location parameters have changed for the big guys. The problem has an easy solution, people in the neighborhood need to support the businesses in the neighborhood. Kudos to Joe for making the effort, but as many of the posters who got here before me have obviously noted; there’s a reason no big-box grocery chain – it just doesn’t make sense to them from both a demographic and locational perspective. His best bet is to go all in at this point by leveling the entire site, build a smaller retail store at the street edge and go after a smaller, boutique operator like Trader Joe’s and/or Aldi (they’re owned by the same company, and often co-locate stores in the same locations). Then create your own customers by doing multifamily housing above. He’s able to get close to 120 units on that site. Fill it with UofL/Spalding Students and hipsters and they’ll be more than happy to shop at TJ’s. Neal, Kroger didn’t “fail” the landlord didn’t renew the lease, get your facts straight. Craig, same answer, referenced in the article if you read it. Thank You broken Sidewalk and Andy for reporting as I had not been made aware of the purchase. This is great news, the neighborhood needs it and will use it. Any retailer willing to fit the neighborhood and not try to cater to only a portion of the audience will do very well. The remodel of that Kroger a number of years back was excellent. I am probably most in favor of an affordable Aldi option. Fingers crossed! Matthew hits the nail on the head. But it’s a very expensive proposition. 3m+ before the first operator opens their doors, without the $density upside of a hotel or high rise apt building. Shannon. Tone it down a little. The Kroger was LOSING MONEY FOR YEARS. That is called “failing”. Your pipe dream of retail and grocery store is just that. It’s unfortunate, but understandable, that things like this are discussed in a vacuum. The issue of grocery shopping is just one of many that can’t be solved by themselves. But when incorporatrd into a larger plan and a different way of thinking, the solutions become apparent. The real problem with Old Louisville is the lack of comprehensive thinking. When evaluated in terms of strengths, weaknesses, and value to the larger community, it’s much easier to see how things can be made to work. But that requires a plan, a buy in from the community, and an entity that can work the plan. The bones of the plan already exist and have for more than 15 years. But to flesh out the plan and bring it on line will take 5 years or more. Politicians aren’t interested because they may not be around to take the credit and the residents want instant gratification. I have banged my head against this problem for over 2 decades and am sick of dealing with the naysayers and a city that just doesn’t care. If you want groceries, a safe, walkable neighborhood, restaurants, and a great place to live, the way forward is there if anyone wants it. The Kroger at 2nd & Breckinridge wasn’t “losing money for years”. That was the Kroger store on 7th St in the Southland Terrace shopping center. The Kroger at 945 S 2nd closed because the owner of the land, the Ohio Teacher’s Retirement System refused to renegotiate a lease. I notice in comments above that there is kind of a chicken-and-egg effect. It seems to me if a well-done development happened, with commerce hustling/bustling, loitering and worse would be better attended to, and thus would be significantly reduced. Also, I don’t think some incredible long-range plan is necessary. Given the main grocery building has been kept up well, it would seem a shame to demolish it. Re-use — after all, this follows the general ethos of the neighborhood, right? It seems to me that there is a big opportunity here for experimental thinking. If you can’t find one tenant — how about multiple ones? How about multiple small food stores in one? How about a “grocery mall”? It’s really not that difficult to brainstorm what can be done with the existing property. 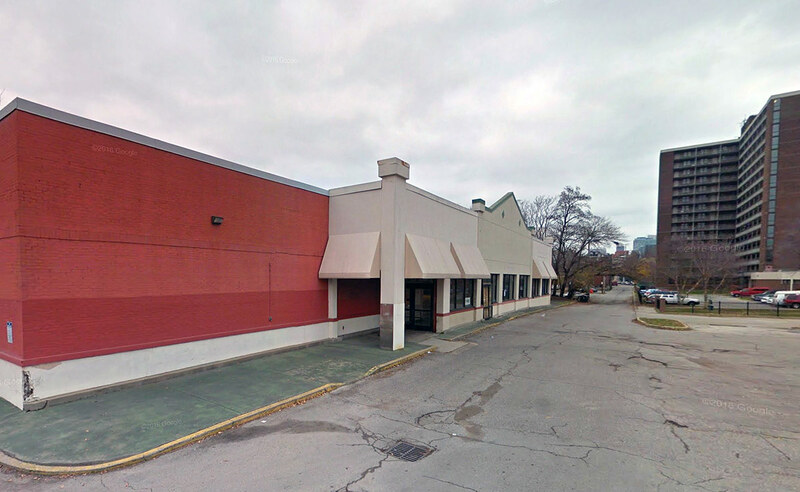 Jeff No: Just to be clear, Kroger was losing money at 2nd & Breckinridge as well as Southland Terrace on 7th Street. 2nd & Breckinridge was not a profitable location for Kroger; the lease issue was just a polite way to close a money-losing location. It was shopped like a large convenience store, and that is not a profitable model for Kroger or an other large, low-markup grocer.